Enable's victory was a second in the premier fillies' Classic for trainer John Gosden, after Taghrooda's success in 2014. Enable, a first-crop daughter of Nathaniel - who Gosden trained to win the Eclipse and the King George VI and Queen Elizabeth Stakes - was sent off at odds of 6/1, beat the 8/11 favourite Rhododendron by five lengths. She was bred by her owner, Khalid Abdullah. It was a dramatic renewal of the race - lightning split the sky in the preliminaries, during which American-trained Daddys Lil Girl was withdrawn after bolting with jockey Olivier Peslier, who threw himself off her to avoid an accident. A sudden heavy shower meant the latter stages of the race were run in driving rain. The race developed into a battle between Rhododendron, ridden by Ryan Moore and trained by Aidan O'Brien, and Enable, under Frankie Dettori, but Enable drew away to win by an impressive five lengths. Gosden said: "That was a real Oaks. The drama before - I hope Olivier is alright, and the flash of lightning when they were loading into the stalls; it was all a bit Hollywood! "I thought they were two magnificent fillies; they fought hard all down the straight. You could see Ryan and Frankie - they are good mates and they each knew what the other was going to do. They locked on three out, and I must say, from the three [furlong marker] to the one [furlong marker] I thought they were in trouble. "She is beautifully bred by Juddmonte, and by old Nathaniel! Good old Nathaniel. "Frankie and Ryan are good mates but they knew they had the two best fillies. Ryan said he was very impressed with our filly when she beat him at Chester. He knew it was going to be a battle. Very exciting. These are fabulous fillies. Enable is in the Taghrooda class [who followed up her Oaks win with victory in the King George VI and Queen Elizabeth Stakes]. I felt that after Chester [where she won the Cheshire Oaks]." The Aidan O'Brien-trained Rhododendron, the very well-backed 8/11 favourite, had to settle for second as she was outstayed in the closing stages in the 12-furlong event. Ridden by Ryan Moore, O'Brien's charge travelled sweetly throughout the contest but struggled to match the finishing kick of the winner under Frankie Dettori, who stayed on well in the final furlong to score by five lengths. Rhododendron's stable companion Alluringly (16/1), ridden by Seamie Heffernan, finished six lengths behind her in third. O'Brien's horses had a troubled preparation this morning due to travel problems on the way over to Epsom but the master of Ballydoyle suggested it was the mile and a half-trip which ultimately saw the three-year-old daughter of Galileo finish second. O'Brien said: "Ryan [Moore, jockey] thought Rhododendron ran very well. Everything went lovely and she has run a very good race. "Obviously the shower before the race made the ground a little bit slower than it was earlier in the day but that wasn't any excuse. "Ryan just felt the last furlong was a long furlong on our filly. Whether the trip was far enough for her or whether she just had a busy day, there was a lot of stuff but she ran very well. "We are delighted with how the fillies ran and obviously the winner is a very good filly. "Donnacha [rode Pocketfullofdreams] went a sensible pace and I don't think he went too strong. The other fillies went their own pace and Ryan followed him down the straight. "I would say that Rhodendron would be very happy going back down in trip." Ryan Moore, on the second-placed 8/11 favourite, Rhododendron, said: "She ran a very good race, the winner is a very good filly, well done to them. We just got out stayed today." 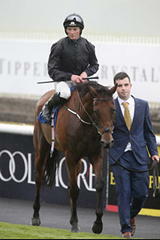 Seamie Heffernan, on third home Alluringly, said: "I followed the second best and the second best followed the best. They are three really good fillies." 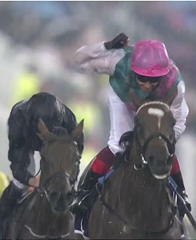 Oisin Murphy, on fourth Horseplay, said: "Delighted with the run. Probably a little bit lacking in experience. I think there is more to come." Andrea Atzeni, on fifth Coronet, said: "She ran good but probably didn't quite handle the track. She wants more of a galloping track." Fran Berry, on sixth Isabel De Urbina, said: "I am delighted with the run, she is a very inexperienced filly. She ran on well in the last furlong and a half. She will improve for that on a more conventional track and could even step up in trip." Donnacha O'Brien, on seventh Pocketfullofdreams, said: "She ran her race, kept going, but isn't Group One class." William Buick, on eighth Sobetsu, said: "She didn't turn up today, she is better than that. Maybe easier ground... she probably doesn't quite stay." Pat Smullen, on ninth Natavia, said: "The undulations of the track caught her out." Olivier Peslier, finding that his mount, the American challenger Daddys Lil Darling, was running away going to the start, bailed out before the stalls and the filly was unscathed despite crashing through a plastic rail.